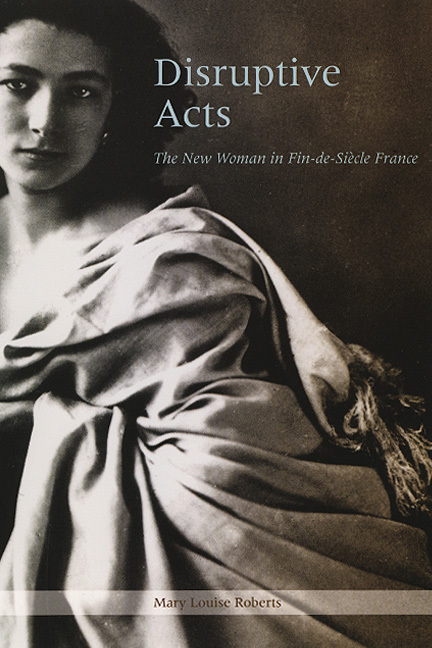 In fin-de-siècle France, politics were in an uproar, and gender roles blurred as never before. Into this maelstrom stepped the "new women," a group of primarily urban, middle-class French women who became the objects of intense public scrutiny. Some remained single, some entered nontraditional marriages, and some took up the professions of medicine and law, journalism and teaching. All of them challenged traditional notions of womanhood by living unconventional lives and doing supposedly "masculine" work outside the home. Mary Louise Roberts examines a constellation of famous new women active in journalism and the theater, including Marguerite Durand, founder of the women’s newspaper La Fronde; the journalists Séverine and Gyp; and the actress Sarah Bernhardt. Roberts demonstrates how the tolerance for playacting in both these arenas allowed new women to stage acts that profoundly disrupted accepted gender roles. The existence of La Fronde itself was such an act, because it demonstrated that women could write just as well about the same subjects as men—even about the volatile Dreyfus Affair. When female reporters for La Fronde put on disguises to get a scoop or wrote under a pseudonym, and when actresses played men on stage, they demonstrated that gender identities were not fixed or natural, but inherently unstable. Thanks to the adventures of new women like these, conventional domestic femininity was exposed as a choice, not a destiny. Lively, sophisticated, and persuasive, Disruptive Acts will be a major work not just for historians, but also for scholars of cultural studies, gender studies, and the theater.